Covered bridges, which feature an enclosed roof and sides to shelter the road surface from the elements, are commonly thought of as a charming reminder of a bygone era. Especially prevalent in New England, wooden covered bridges draw visitors from around the country. In fact, there are examples of covered bridges in many different locations across the United States. These unique and largely obsolete bridges do possess certain advantages and disadvantages when compared to other bridge types. Perhaps the most obvious benefit of covered bridges is the shelter they provide. This explains why so many covered bridges were built in areas that see harsh winters. The sloped roof of a covered bridge prevents snow and ice from accumulating on the bridge and weighing it down. It also keeps the road surface clear for travel. The result is lower maintenance cost and less frequent need for repair or replacement of the bridge. A covered bridge may last up to three times longer than an uncovered bridge in the same climate. Covered bridges have the disadvantage of costing more to build than their uncovered counterparts. This is because the bridge must first be constructed without a cover and then have the cover added in an additional step that takes more time and extra building materials. 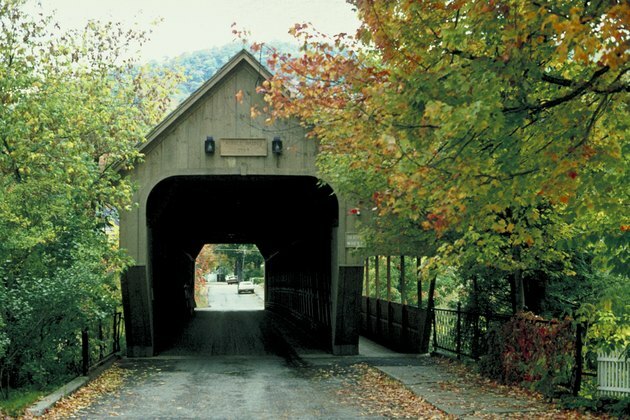 Although covered bridges may require repair less frequently, there are more components that may need regular maintenance, such as the roof tiles or windows in the walls of the bridge. In cases of flood, the complete destruction of a covered bridge can be particularly costly. The aesthetic advantage of some covered bridges can't be overlooked. Today, some New England towns pride themselves on their covered bridges. The bridges provide a boon to the regional tourism industry and are often at the center of local restoration and historical preservation efforts. To many residents and visitors to areas where covered bridges are common, they represent an important era in America's past. Although architects may use a number of different methods when designing and constructing a covered bridge, they are generally not as strong as more modern bridges. Most covered bridges are wooden, which places severe limitations on the amount of weight their decks can support and the amount of traffic they can carry before needing maintenance. Metal bridges, such as suspension bridges and beam bridges, are more efficient in heavily trafficked urban areas or along major shipping routes. Dennis Hartman is a freelance writer living in California. His work covers a wide variety of topics and has been published nationally in print as well as online. Hartman holds a Bachelor of Fine Arts from Syracuse University and a Master of Arts from the State University of New York at Buffalo. What Is a Reverse Gable Roof?